I could have easily titled this post "wrinkled" but that would have drawn attention to all that is wrong with this outfit (and linen/chambray in general). But wrinkles are like battle scars; evidence of a hard day's work. I'll spare you all the boring detail so have a great evening! Cool casual chic!! Love the neutral pants! BTW, love ur blog, and now your latest follower on GFC!! Hope you are having a wonderful day! 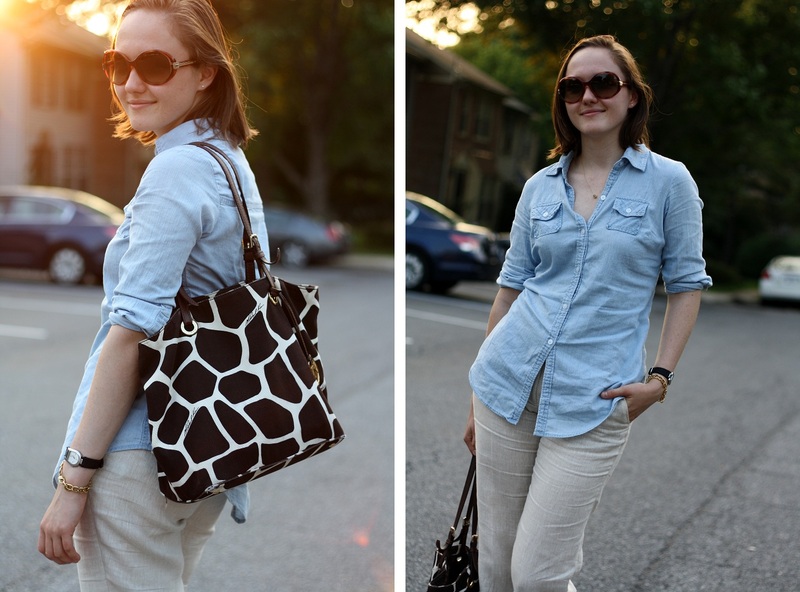 I really love your giraffe print bag. Great Marshall's find. I hate it when I steam and work so hard on my linen pants and just when they reach perfection I sit down and they get wrinkled so badly! You are on a neutrals kick :) Your style latey is very European. I love these pants, they're totally gorgeous and pair perfectly with the denim top. That is the bummer about linen, but it is so comfy and breathable on a hot day! Love the simplicity of this outfit though. Have a great weekend!